Summit Education Initiative’s GradNation Community Summit brought more than 400 students, education professionals and community members to Quaker Station in Akron on Jan. 7. University of Akron Graduate Assistant David Delgado did not have the easiest upbringing in Wooster. He was one of six children his single mother was raising while putting herself through college and working a full-time job. Lack of money caused a lot of stress in the household and they often had to choose which utility to keep on. Homelessness was looking like a reality for Angeline, her husband and their two dogs, until the Nazareth Housing Development Corporation (NHDC) intervened. “We were living in a rental property and it was foreclosed on. The landlords hadn’t been paying off loan, so it went to auction,” Angeline explained. NHDC not only bought the home, but rehabbed it as well. “We had issues for a long time that the landlords hadn’t taken care of – trouble with our water which had e-coli in it – it was well water. They rehabbed it and gave us updated appliances and we’re now on our way to becoming homeowners for the first time!” Angeline said with excitement. The question is, if NHDC hadn’t stepped in, where would Angeline and her family be today? Would they be living on the streets, or in a homeless shelter? “I have no idea where we would be right now without Nazareth. We were very unsure of what we were going to do. (My husband and I) both work and go to school full time. If we tried to find an apartment or something that could take us and our dogs in within two weeks it would have been impossible. We definitely wouldn’t be on our way to home ownership if it weren’t for their help,” Angeline said. “They’ve helped us with credit rehabilitation and to get us into a place that suits our needs very well. If it hadn’t been for them we would’ve probably spent a good deal of our time either homeless or in a place that would not have worked at all for us,” she continued. 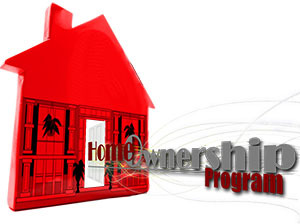 Along with making home ownership a reality for many who never dreamt they would own a home, NHDC works with others in the community to help their clients repair their credit and stay educated in the many areas of home ownership. “NHDC works with the East Akron Neighborhood Development Center to get your credit where it needs to be,” Angeline said of its many advantages. 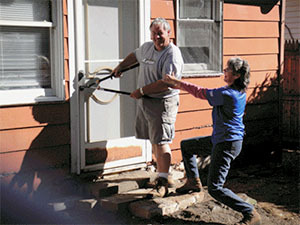 NHDC makes it their goal to stay intertwined and connected with other community foundations. After all, it was a group of people from four different Catholic parishes that came together to start this project. 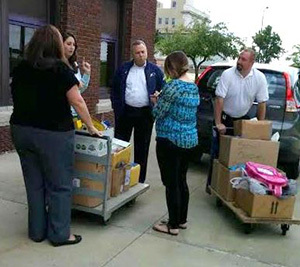 “We’ve had projects that wove us together with Akron Metropolitan Housing Authority (AMHA). They have multiple programs that help people become more self-sufficient and that’s where we intersect with them. AMHA offers a wide variety of services and really is a leader in terms of providing affordable housing in a consistent and healthy way in Akron,” Nanci Self, Executive Director of NHDC, said. NHDC and AMHA work together beautifully, in a way that neither could alone. “We intersect on the other end when people want to get out of public housing, maybe need a boost… to kind of hold their hand while they navigate the waters trying to figure this stuff out,” Self explained. “If you don’t come from self-sufficiency it’s like learning a new language. You have to take baby steps. Learn a little at a time, practice it, learn a little more, practice it… I always tell my clients that it’s like learning Greek. You didn’t just wake up one day and learn it,” she continued. “Another one of our partners is the East Akron Neighborhood Development Center and Mustard Seed Development Center. They’re both providers of home/buyer education and are HUD certified. We choose not to be HUD certified. One thing we have our clients do is get their HUD certified classes under their belts, get their action plans created and their household budgets and spending plans together, and figure out where their credit is and work on repairing it. Most people need some repair,” Self said. Angeline and her husband make sure to give back to this cause that changed their lives through their volunteer program. 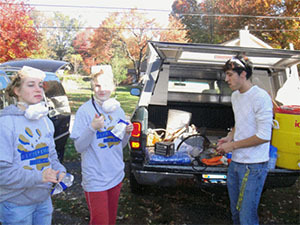 “Nazareth has such good community involvement and has helped so many people in the area, and us. We definitely want to give back,” Angeline said. The program is open to anyone who is willing to help lend a hand with their projects. “We have a great volunteer program. 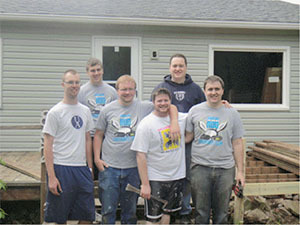 We were recently adopted by the University of Akron for their Martin Luther King Day of Service. A group came to Nazareth to work on their day off. It was just awesome,” Self said. “One time we had a team from Time Warner. This way we can accomplish more on the houses with less money. Because we’ve had more help we were able to spend less on the houses, make them more fun and interesting and do more special events,” Self continued. “Another incredible thing that Nazareth has going for us is our staff. We are small but mighty. Our construction manager has decades of experience in all kinds of building trades,” she said.